For many people, water voles (Arvicola amphibius) will forever be associated with wise and kindly Ratty from Kenneth Grahame’s enchanting children’s book The Wind in the Willows. Published in 1908, it would no doubt have shocked the author, as he penned the vivid world of the river bank and the sprawling Wild Wood, to know that in just over a hundred years, 95% of our water voles would have disappeared. They have desperately suffered throughout the 20ᵗʰ century, and are one of Britain’s most declining mammals. Water voles can be found close to any body of fresh water, rivers, reed beds, streams, lakes and ponds, moorlands and even ditches, but intensive farming, bad waterway management and habitat destruction and fragmentation have been steadily destroying water vole populations over the last century. Escaped American mink (Neovison vison), imported from America to UK fur farms from the 1920’s, proved a catastrophe for our water voles. Mink prey on water voles and are impervious to the voles’ defence of diving, disturbing the riverbank to murk their pursuer’s view, and disappearing into their burrow; mink can squeeze into water vole burrows, wiping out entire colonies rapidly. Being at the bottom of the food chain doesn’t help their cause, and many of our native species predate them, including foxes, stoats, weasels, owls, herons, marsh harriers, pike, and they are also killed by cats. The waterways of last century were teeming with Ratty’s cousins, riverbanks everywhere punctuated with their burrow entrance holes, colonies strung out along the waterway, rivers busy with the to-ing and fro-ing of water vole activity, but now they are in real danger of becoming extinct in the UK. Though similar in size and appearance, water voles are not rats, but, as the name suggests, a large species of vole. Water voles have thick, sleek brown fur, with small rounded ears, a dark tail and, by Kenneth Grahame’s description, a twinkle in their small black eyes! Known colloquially as water rats or water dogs, they swim similarly to the latter, with their backs and heads visible above water as they pootle along the river. Their burrows form large and complex underground tunnel systems, and their sleeping chambers are built into the steepest parts of the bank, often with a number of entrances, including sub-aquatic ones that provide secret escape routes should danger approach. They are fierce guardians of their personal territories; a female’s territory spans 30-150 metres, while males roam further at 60-300 metres, which can overlap several female territories. They are a sociable species, living in large colonies, and sometimes sharing nests during winter. A common sign of water vole activity is a pile of droppings, or latrines, old topped up with fresh, that females use as boundary markers, as well as their entrance ways dotted along the river banks. They have a long breeding season, from March to October, and can have 2-5 litters of 2-8 pups every year, born naked and blind in underground nests woven from grasses and reeds. Pups leave their mother after only a month, and spring-born pups sometimes breed later that year in the autumn. 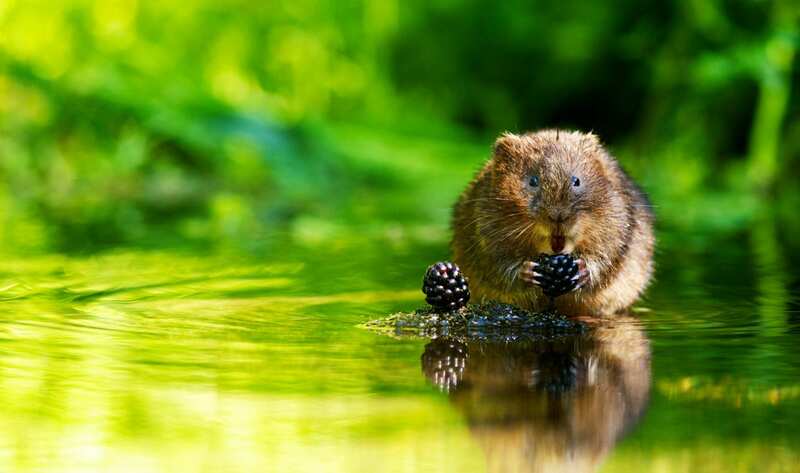 Most water voles do not survive for more than two winters, and they need to eat 80% of their body weight every day, including over winter as they do not hibernate. Their diet consists almost entirely of grasses, sedges and rushes, supplemented with tree bark and fruit in the colder months, and, very rarely, insects. Mink are not being controlled sufficiently in Britain, and as such wildlife charities are the main drivers in protecting and reinstating Ratty along our waterways. Water voles are protected under the Wildlife and Countryside Act, but that isn’t enough to protect them from predation and habitat loss. Water voles belong here, in our wild watery places, and as long as mink are at large they need and deserve our ongoing protection, to forever keep these magical animals gambolling about our river banks.